Kyle Wiltjer for the win in an outstanding finale. Kyler Wiltjer drained the mid-range jumper at the buzzer to hand Unicaja Malaga 99 – 97 victory over Manresa. Five seconds prior to Wiltjer’s bucket, Manresa guard Ryan Toolson capped a 30-performance by hitting a tough corner triple to tie the score. But then Malaga players executed a perfect offense that resulted in Wiltjer’s game-winner. It was one of the most sensational finales of the season in the Spanish ACB League. 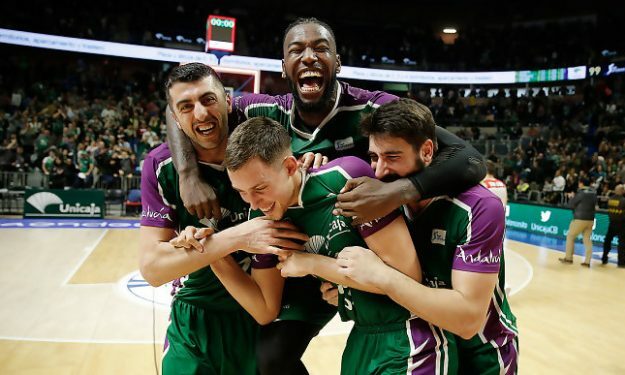 Los cinco jugadores de @unicajaCB tocan el balón y cruzan la pista entera para anotar la canasta ganadora… CON SOLO DOS BOTES Y EN MENOS DE CINCO SEGUNDOS. Wiltjer finished with 14 points and seven rebounds. Giorgi Shermadini scored a game-high 19 for Malaga while also grabbing five rebounds. Jaime Fernandez added 14 points. Unicaja is now 13 – 7 and fourth in the standings. Tomislav Zubcic had 14 points for Manresa that dropped to 11 – 9 but remains eighth and in the playoffs zone.